Discussion of classical Indian Buddhism in the early centuries of the first millennium has generally been done within the geographical limits of the Indosphere stretching from what is now Afghanistan down through to Sri Lanka. While Buddhism in the early centuries did expand outside this region to areas like Central Asia and China, Buddhism as a major institution and civilization was in the 3rd century still largely limited to the subcontinent and Persian borderlands. However, the fortunes of Buddhism in the second through fourth centuries CE have to be understood within a greater geopolitical context stretching from the Roman Empire across Asia to China. The prosperity and misfortunes that Buddhism experienced in India were in fact intricately tied to international trade and commerce. Giovanni Verardi in his recent work Hardships and Downfall of Buddhism in India explains how Buddhism in India established an “open society” across the subcontinent which was effectively an urban pro-trade social model in contrast to the competing Brahman agrarian model based on caste. Whereas the sangha was dependent on and intimately connected to commercial activities and the merchant classes for funding and protection, the Brahmans sought to secure an alternative agrarian order which provided them with supreme authority, even over kṣatriya kings. Such competing social models inevitably led to conflict. One might even describe it as class warfare. In the traditional caste system a merchant is given a lower position, so it is unsurprising that they might support Buddhism which rejected a preordained social order, and moreover provided merchants with prestigious status as benefactors as well as the opportunity for spiritual attainment. It was also in the interests of some kṣatriya kings to favour Buddhism as they could emulate the cakravartin ideal and increase their power base through taxation of merchants, whereas in the orthodox Vedic model they were supposed to give gifts of cattle and tax-free land to Brahmans, as well as act as caretaker of a throne with the real political power being held by the Brahman priests. The well-being and sustainability of Buddhism in India in this period effectively rested on trade, which in India was part of a larger pan-Eurasian network stretching from Rome to China. In this period Buddhism had already changed into a highly organized Vinaya-based monastic model. It grew increasingly complex by assembling an extensive written canon that needed to be continually physically reproduced. It further came to have sophisticated artistic traditions. All of this required resources and people plus continual investments to maintain everything. The monastic model in India was parasitic on the economy. It generally consumed resources and did not produce much in the way of agricultural products or commodities, though it did function in the tertiary sector of the economy. Buddhist institutions often operated money lending and storage services. All things considered, Buddhism was a capital intensive religion, much as it largely still is in most of Asia. Predictably, any disruption to capital inputs naturally undermined the religion, which indeed is what happened. Gold coin of Kaniṣka I with Buddha image. I would add that prior to St Cyprian's plague, there had been another plague starting a century prior which severely damaged the Roman economy and significantly decreased the population: the Antonine plague which reached the empire in 165. Within a few years it had annihilated a sizable portion of tax payers in Egypt alone, which was also the bread basket of the empire. There were further outbreaks of plague in 172, 174, 175, 179, 182 and 189, and thereafter again in the 250s and 260s. During the Fayum area of Egypt during the Antonine plague the tax base dropped 33-44%. Other areas saw declines up to 93%, though some of that would have been as a result of flight. Under Domitian (reigned 81-96) the silver content of the denarius was 3.28 grams, but by the end of the following century the silver equivalent had fallen to just 2 grams. 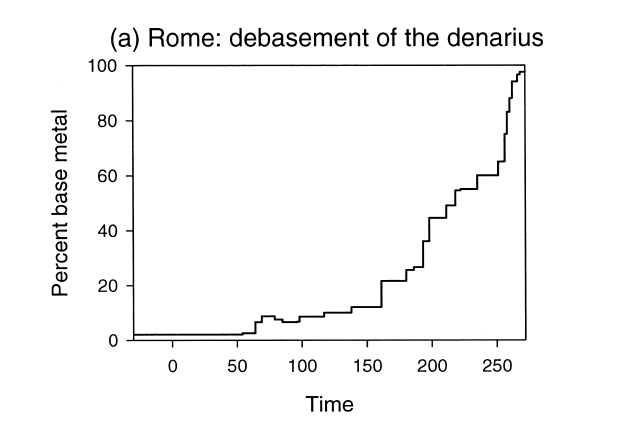 By 272 the denarius only had 2.5% silver in it. By the time St Cyprian's plague hit in 251, the Roman empire was already suffering critical financial problems, which contributed to the fall in international trading activities. Verardi also rightfully notes another contributing factor in that decline: the collapse of the Han dynasty in around 220 CE. The Han Dynasty is divded into the western or former Han (206-9 BCE) and the later or eastern Han (25-220 CE). It was during the latter that important local changes unfolded which inevitably reduced China's contribution to the aforementioned pan-Eurasian trade network which Indian Buddhism depended on. Emperor Guangwu 光武帝 (reigned 25-57 CE) abandoned an earlier offensive strategy along the north frontier against the Xiongnu (barbarian horsemen), who subsequently increasingly engaged in profitable raiding. Populations fled to the south leaving many areas depopulated. Nomads had to be settled in abandoned regions to fend off the Xiongnu. Between 2-140 CE the formally registered population in the north-west dropped by 70%, while the population in the south increased as much as 100% in some regions. Despite the defeat of the Xiongnu confederation in the 80s, the Xianbei and Qiang tribes replaced them and continued causing trouble for the Han court. Rebellions occurred and provinces were abandoned. In 143 official salaries were reduced and the court had to start borrowing money, demonstrating severe financial problems. In the end the last Han emperor abdicated to warlord Cao Cao's son in 220, marking the end of a nominally unified Chinese empire and the beginning of a ghastly period of perpetual war and instability.9 All this meant a sharp decline in Chinese exports and imports. One other important factor in the decline of international trade that Verardi does not mention was the collapse of the Parthian empire. Parthia incidentally had a role to play in the aforementioned plague outbreak of 165. The Romans had taken the Parthian cities of Seleucia and Ctesiphon, but suffered an outbreak of what was probably smallpox which they brought back to the empire with them when they retreated. We might surmise that Buddhism in Persia, albeit a minority religion, still could have played a role in trade, but also functioned as another major benefactor to Buddhist civilization both in the Indosphere and Persia. This might not seem so unreasonable when we consider how later institutions like Nālandā received sponsorship from lands as far away as Java. The frontiers of Persia and the Indosphere also had plenty of Buddhist peoples, such as Bactria. Setting aside such speculation, Parthia in its later years suffered chronic civil strife, a devastating epidemic of smallpox and repeated wars with foreign powers including the Romans, which enabled the rise of the Sasanians (reigned from 224-650 CE). The leader Ardašir went on to capture parts of Armenia, northwest Arabia and the western provinces of the Kuṣāṇa empire. The latter came to be ruled by Sasanian princes. Thereafter he turned west and secured Roman border towns and besieiged Hatra. This predictably led to war with the Romans. We might imagine that the fall of the Parthians and the subsequent wars both on the western and eastern borders of Persia led to decreased trade given the conflict. The Sasanians also had to fend off the nomads from the north, which likewise became a problem for powers in Europe and East Asia. To summarize, in the third century we see the Roman empire increasingly crippled politically and financially as well as the end of the Kuṣāṇa, Parthian and Han states. The geopolitical situation on the Eurasian continent was largely quite unstable from the Atlantic to the Pacific. It is therefore easy to understand why such a decline in international trade occurred and how it undermined the sustainability of institutionalized Buddhism which had come to be in many ways an extension of the Indian mercantile system. Buddhist monasteries in India often provided storage and money lending services in urban areas, which facilitated commercial activities and no doubt encouraged increased patronage from the merchant classes which aligned their own interests with that of the sangha. This was ultimately the undoing of Indian Buddhism for a time, though it did recover but not without suffering hard times, both in terms economic support and a shifting religious atmosphere which saw increasing hostility from forms of Neo-Brahmanism. The hard times that Buddhism increasingly faced is further reflected later on in the epigraphical record as well. Schopen has examined the relevant inscriptions extensively, which Boucher summarizes stating, “When the Mahāyāna does begin to appear on the scene in Indian Buddhist inscriptions, roughly around the fourth or fifth century, the Mainstream schools increasingly cease to be found epigraphically as recipients of substantial patronage.”15 This likely more reflects the final collapse of the Roman empire and the consequential decrease in coinage in India, but such a decline can already be traced back to the second and third centuries. As mentioned above, within India as well Buddhism was under increasing pressure from rival religious Neo-Brahmanistic movements, which contrary to former orthodoxy started portraying the divine in art, a practice they probably adopted from the Buddhists. They furthermore developed popular practices that substantially deviated from the orthodox Vedic norm, but unlike the Buddhists they never challenged the caste system. By the fifth century when the Chinese monk Faxian 法顯 (338-c423) visited India, Buddhism was still present and in some regions thriving, but had undergone a few centuries of hardship and decreased support as epigraphical evidence suggests with respect to sponsorship. Some Mahāyāna sūtras from those hard times take on a particularly pessimistic tone, speaking of how the end of Buddhism is near, such as the Mahāparinirvāṇa Sūtra. Later on the Arthaśāstra from the Gupta dynasty (320-550 CE) takes on a clearly anti-śramaṇa stance. Nevertheless, following the collapse of the Guptas the stage was set for the empowerment of Mahāyāna traditions across north India which prior to that had often been a despised movement. We looked at this in an earlier post 5th Century India: a Turning Point in Buddhist History. The development of Buddhism in India has to be understood in this greater geopolitical context. It is simply not enough to limit one's framework to the Indosphere. 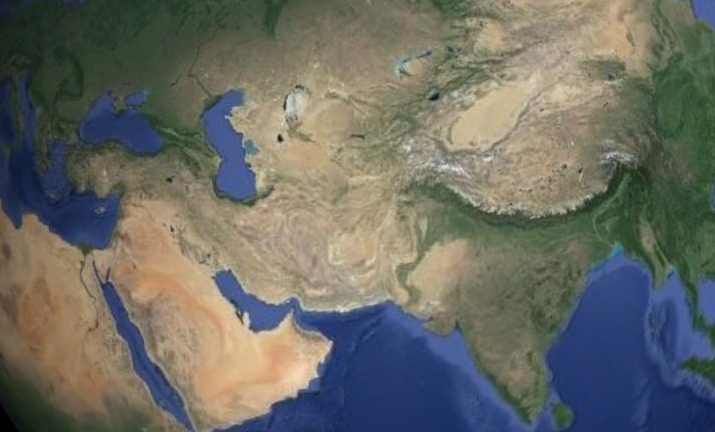 This might seem rather daunting, but in reality to understand the historical development of Indian Buddhism, one must understand the greater Eurasian history. The major events in Europe, Persia and China often had an impact on the development of Buddhism on the subcontinent. The famous Graeco-Buddhist artwork from Gandhāra, the descendents of Alexander's men, is one immediately apparent example, but in terms of philosophy and the arcane as well there are distant influences at work as well, most notably in Buddhist Astrology. We will discuss some these subjects in greater detail in future posts. 1 Romila Thapar, The Penguin History of Early India From the Origins to AD 1300 (London, England: Penguin Books Ltd, 2002), 242-243. 2 Giovanni Veraridi, Hardships and Downfall of Buddhism in India (New Delhi, India: Manohar, 2011), 91. 7 Peter Turchin and Sergey A. Nefedov, Secular Cycles (Princeton, New Jersey: Princeton University Press, 2009), 233-235. 9 See Mark Edward Lewis, The Early Chinese Empires Qin and Han (Cambridge, Massachusetts: The Belknap Press of Harvard University Press, 2007), 24-29. 12 Erik Seldeslachts in "Greece: The Final Frontier" in Handbook of Oriental Studies The Spread of Buddhism, edited by Ann Heirman and Stephan Peter Bumbacher (Leiden: Brill, 2007), 143. 14 Xavier Tremblay in "The Spread of Buddhism in Serindia" in Handbook of Oriental Studies The Spread of Buddhism, edited by Ann Heirman and Stephan Peter Bumbacher (Leiden: Brill, 2007), 80. 15 Daniel Boucher, “Dharmaraksa and the Transmission of Buddhism to China” in Asia Major, Volume 19, part 1/2,2006, 37. This blogpost is worthy of publication! Do you submit to journals? Well done! A remarkable tour de force of pan-Asian history. Congratulations! Publishing for journals is a big step towards advancing your career, but on the other hand they are often not really accessible to the public. A lot of journals require subscription, which most people don't have. Whereas if I put it on my blog everyone can read it, and the search engines pick it up. In any case, even though I'm a scholar, I'm not interested in advancing my career. I just write these articles because I enjoy research and know others benefit from it. As I read extensively I start seeing connections between various historical developments and to make sense of it all I write articles like this. Writing really helps me learn the material. It is an exercise in itself!